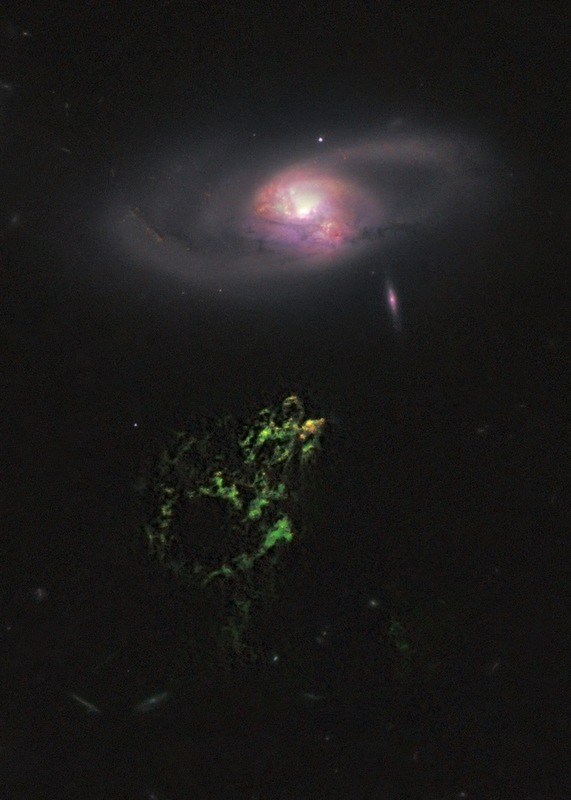 Hanny's Voorwerp and galaxy IC 2497 was discovered by a Dutch schoolteacher taking part in the Galaxy Zoo project. Voorwerp is Dutch for object. The yellow areas are regions of star birth, thought to be fuelled by gas flowing from the galaxy compressing gas in Hanny's Voorwerp. The green area is the only visible part of the streamer, which stretches around the galaxy and is 300 light years long. It used to be that you had to have years of training before you could participate in cutting-edge science. But that has changed, with the power of the internet enabling thousands of ordinary people to contribute to one of humanity’s most exciting endeavours from the comfort of their homes. It was announced in May that a cluster of galaxies millions of light years away was discovered by a team of citizen scientists clicking on images on their computers at home. Citizen Science first became prominent in 2006 with the launch of Stardust@home by the University of California-Berkeley, quickly followed in 2007 by Galaxy Zoo, which aimed to classify galaxies from optical images. Now, many such citizen science projects span all fields of science from astronomy to biology. The idea is simple: the average human brain is far superior to our most powerful computers when it comes to problems like image recognition. So citizen science projects combine the brainpower of thousands of ordinary people to solve some of science’s most challenging problems. What do the citizen scientists get out of it? In most cases, the knowledge that they are helping to expand the frontiers of human knowledge. And perhaps the chance of making a truly great discovery. The Evolutionary Map of the Universe (EMU) project will survey the radio sky using CSIRO’s new A$165-million ASKAP telescope being built in Western Australia, to understand how galaxies form and evolve. We expect EMU to discover about 70-million galaxies from their radio emission, compared to the 2.5-million so far known. But we have a problem: to get the best science, we need to cross-match these radio sources with galaxies spotted by infrared and optical telescopes, and no research team has enough members to match 70-million objects by eye. About half of EMU’s radio sources are galaxies like our own Milky Way, with radio emission resulting from the debris of star formation, so that the radio source is easily matched to the optical galaxy. The other half are caused by jets of electrons squirting out from a massive black hole at the centre of the galaxy, producing two giant blobs of radio emission either side of the galaxy.